There are a range of facilities, equipment, training and inductions available to affiliated researchers. In conjunction with the University of Newcastle and Hunter New England Health, there are a wide range of facilities, resources and equipment available to affiliated researchers. HMRI aims to help researchers by providing them with up-to-date information on the resources available on the campuses. A confocal microscope is available for use by HMRI affiliated researchers. Extremely high quality images are able to be produced from a wide variety of tissue preparations using the Leica TCS SP8 MultiPhoton confocal microscope. To enquire about training or use of this microscope, please contact Associate Professor Rohan Walker at Rohan.Walker@newcastle.edu.au. 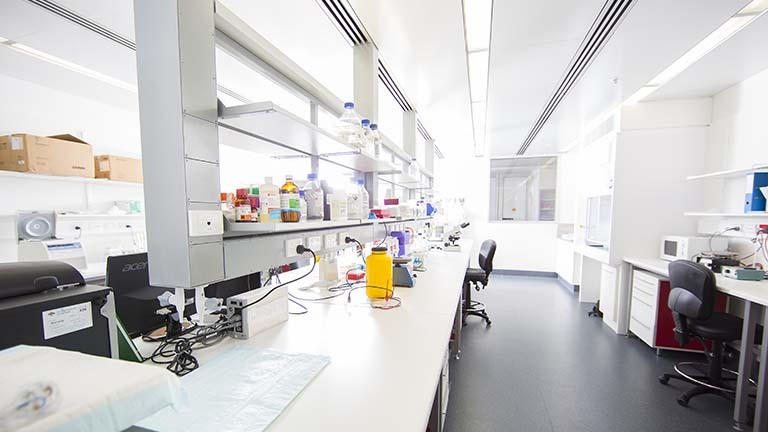 The HMRI Building also houses a fully equipped tissue culture laboratory containing incubators, biohazard hoods and microscopes. Anyone wishing to use this facility must first be inducted and trained to ensure high standards are maintained. Please contact Dr John Fitter at John.Fitter@newcastle.edu.au for more information. 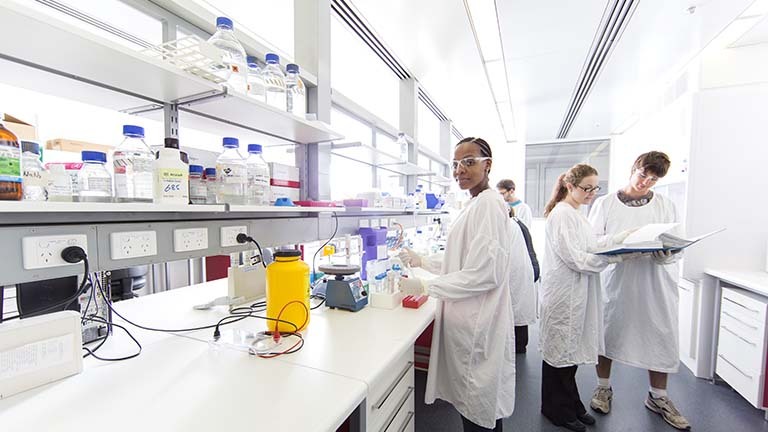 A dedicated protein analysis laboratory exists on level 3 West of the HMRI building for shared use by HMRI researchers. It houses a number of electrophoresis and transfer tanks for traditional western blotting as well as automated protein quantification systems such as the Wes and the Simple Western system for high throughput processing of samples. Please contact Dr John Fitter at John.Fitter@newcastle.edu.au for more information. A behavioural research suite including cognitive testing equipment has been installed and is available for collaborative use. To enquire about the capabilities of this equipment or to arrange an inspection, please contact Associate Professor Rohan Walker at Rohan.Walker@newcastle.edu.au. The Seahorse XFe96 Analyser with prep station is available for measuring the metabolic phenotype of cells by simultaneously measuring mitochondrial respiration and glycolysis in real-time and the shift between the two pathways under pathological states to measure the bioenergetic state of cells. It also enables the assessment of the physiological traits of cells with both genomic and proteomic data. This shared piece of equipment is located on Level 2 of the HMRI building and can be accessed by contacting HMRI Facilities Management at fm@hmri.org.au. The HMRI Imaging Centre is one of the first facilities in the world to house a state-of-the-art Siemens MAGNETOM Prisma 3T scanner devoted entirely to medical research imaging purposes. The HMRI Imaging Centre is co-located with the HMRI Building on the Rankin Park Campus in Newcastle. What can the Imaging Centre be used for? Researchers can use Imaging Centre to carry out their imaging component of the research using 3T MRI scanner. We have the capability to perform high quality structural, functional, and spectroscopy studies. The MRI scanner is available for clinical and biomedical use. If you are affiliated with HNEH or have a general enquiry please submit an enquiry to Jameen Arm to discuss the feasibility and to organise a trial. Alternatively, if you are affiliated to UoN, contact Dr Saad Ramadan for guidance. Once the study is approved, researchers need to contact Shirley Savy to complete the formalities. The HMRI Core Histology Facility (CHF) provides a range of cost-effective, high quality and efficient histology services available for use by all HMRI affiliated researchers. The CHF has experienced technical staff and specialised equipment to ensure your research is of the highest quality. In order to assess single cells within an experiment, a single cell analysis (SCA) laboratory is available to HMRI affiliated researchers. This laboratory houses three core instruments; the Fluidigm C1 Single-Cell AutoPrep System, the Juno™ controller and the BioMark™ HD System. Fluidigm technology is based on microfluidics with all steps carried out within integrated fluidic circuits (IFCs). These single cell experiments are capable of measuring gene expression, microRNA expression and lncRNA expression. In a typical assay, 96 analytes can be measured on 96 individual cells giving a dataset equivalent to 24 x 384 well plates. Together, these equipment can perform SNP genotyping as well as single-cell mRNA sequencing, single-cell DNA Sequencing and single-cell targeted resequencing. The facility also offers a full range of ancillary equipment where users can prepare their samples in convenient proximity to the SCA instrumentation. This includes biohazard cabinets, CO2 culture incubators (including oxygen control for hypoxia experiments), an automated cell counter, centrifuges, microscopes. To access these services or learn more, please contact Dr Rick Thorne at Rick.Thorne@newcastle.edu.au. In conjunction with the University of Newcastle and Hunter New England Health, there are a wide variety of other services and resources available to HMRI affiliated researchers within Newcastle and the Hunter. HMRI’s role is to provide affiliated researchers with a list of services that are available by one or a combination of HMRI’s collaborating partners. The University of Newcastle offers extensive IT Support and statistical services as well as access to flow cytometry, mass spectrometry, electron microscopy and x-ray services. The University also hosts regular information sessions regarding shared specialised equipment with upcoming sessions on NMR Spectrometry, chemical synthesis techniques, 3D Bio-Printers, Laser Lightsheet Microscopy and the MRI Centre at the HMRI Building. The state-of-the-art HMRI Building is a $90 million investment in the future of medical research and national and international health care. The HMRI Building is located on the northern side of the John Hunter Hospital (JHH) campus, New Lambton Heights, in NSW, Australia. 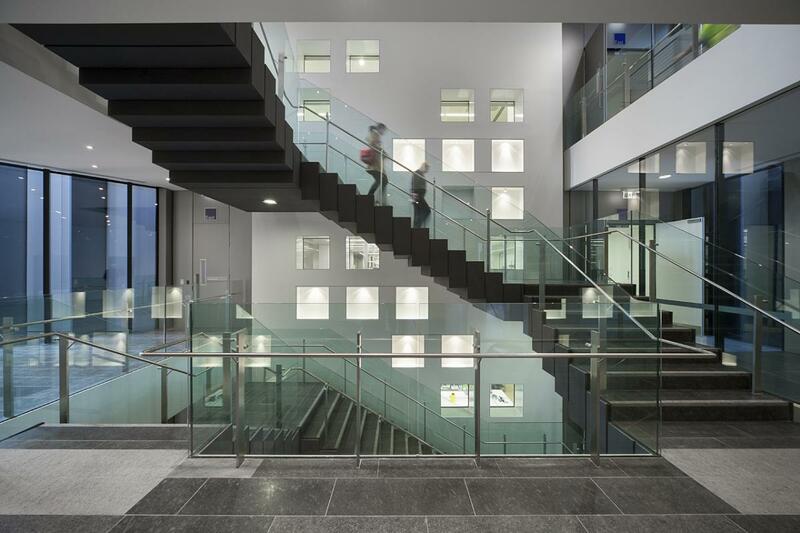 As the hub for almost 400 of the Hunter Medical Research Institute’s researchers, the HMRI Building houses open-plan laboratory and office space along with a Clinical Trials Centre for seamless interaction with patients and study participants. The HMRI Building brings together four of the Institute’s key research programs, and was designed to facilitate collaboration and translation of quality medical research – research that is the key to greater knowledge of specific diseases, delivering new treatments and better health outcomes for patients and their families. The four-storey, 16,000 square metre facility allows co-location of biomedical, public health and clinical researchers in close proximity to the region’s largest teaching hospital, facilitating effective translation of research into improved health outcomes. The HMRI Building is the realisation of a long-held vision to build a world-class research centre in the region, and signals the start of a bright new era. It will support the continued growth of HMRI, which is already the third largest medical research institute in NSW, and assist Hunter researchers to continue to deliver research of international significance. The Building was jointly funded by the Federal and State governments. It plays a vital role in attracting and retaining the best researchers and clinicians to work in the Hunter, and ensures contemporary and innovative health care options are available to the people of the Hunter and across the world. HMRI’s Facilities Management team offer a variety of services to researchers within the HMRI Building. The team provides a single point of contact for all matters relating to the HMRI Building and the services within it. The service is available 8:30am to 5:00pm, Monday to Friday. All general and non-urgent requests should be logged via email: fm@hmri.org.au. Planning on Working at the HMRI Building? If you are coming to the HMRI Building, please read the HMRI Building Workplace Guide. This document contains answers to many common questions, so you are encouraged to download and read this in the first instance. All HMRI Building occupants are required to complete a Building Induction which covers important information about working safely at HMRI. There is more information below about the HMRI building induction and equipment training. Staff security access cards are linked to inductions, and are programmed according to the internal access requirements of each individual. All HMRI Building occupants are required to complete a Building Induction which covers important information about working safely at HMRI.Staff security access cards are linked to inductions, and are programmed according to the internal access requirements of each individual. All persons requesting access to HMRI wet laboratory areas must satisfactorily complete the HMRI Laboratory Induction. The Induction comprises a reading component as well as completion of an online the University of Newcastle’s ELMO Laboratory Safety Module and the HMRI Laboratory Induction Quiz. All Contractors undertaking work at the HMRI Building are required to complete a building induction prior to arrival. To arrange a contractor induction, contact HMRI Facilities Management. Training is provided at HMRI on all aspects of fire and life safety, first aid, laboratory safety, chemical spills, liquid nitrogen and gas handling. Affiliated researchers will receive building and training updates throughout the year via email by the Communication Team. Please contact facilities management if you require further information about training at the HMRI Building at fm@hmri.org.au.